Ponorogo Town Square is located in Ponorogo regency. The most prominent from the capital of Ponorogo regency town square is the wide and beautiful roads and decorated by various statue sorts in almost every intersection of the road. One of the statues that is become Ponorogo monument of the community's pride is SUKOWATI Statue, a fighter from Ponorogo who can met in the great side of road to entered Ponorogo city that is the north main gate. Ponorogo town square traditionally is the place of Ponorogo community that gathering in various forms of celebration. 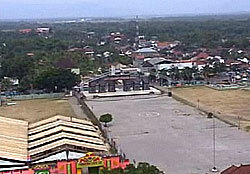 Ponorogo town square also became the centre of various official of government activities. In Town Square, we can found lion statues in each corners, and as the center piece was gotten the giant's stage that used as the main stage in REOG NATIONAL FESTIVAL that held each year along with Grebeg Suro celebration. In Town Square also operated by the buggy and the toy carriage. Ponorogo Regent controlled his government from the Regional Government's Office Complex. From this peak building that have eight floors, we can find LOOK RELAY STATION where the person could enjoy the scenery around it. Sasana Praja is the meeting building that representative and became Ponorogo community's pride.